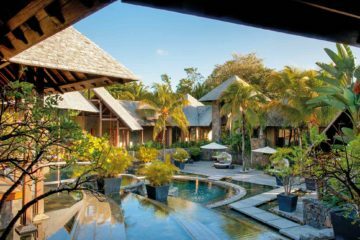 There’s no doubt about it, Mauritius is paradise – a small island sheltered by barriers of coral reefs in the Indian Ocean, creating crystal-clear lagoons whose only competition is the perfectly white sand beaches and azure sea. We fell for it, hard. There’s no shortage of luxurious places to stay here, but our go-to is always Beachcomber Hotels – they were the first on the island and snapped up some of the best locations for their eight prestigious properties. On this particular trip, we stayed at the Dinarobin, the brightest jewel in the Beachcomber crown. Our stay here granted us picture-postcard views of tropical gardens, thatched villas and grand colonial buildings, as well as a mile of beautiful beach and the dramatic backdrop of Le Morne at every turn. Our suite was set in the property’s ‘Crescent 6’ – a set of rooms reserved exclusively for adults only – secluded, discreet and providing access to a no-children garden pool, the perfect sanctuary after a day on the beach. Furthermore, as residents of these special suites, we were given complimentary access to the Club at Dinarobin – a VIP lounge where we enjoyed light lunches, drinks and pre-dinner cocktails each day.